MorphMarket's two-way rating system enables both buyers and sellers to build a reputation that gives confidence to those doing business with them. The system is based on transactions confirmed by both parties through our inquiry system. Our format focuses on being brief and to the point and excludes third party opinions, but we allow allow linking to more lengthy investigations in other forums. We also have protections in place to guard against fake reviews. You should always do your research before conducting business with another party on the internet. Our ratings system should be a first step in that process. For more ideas on researching sellers, check out our guide. A seller's rating page can be reached by clicking on the rating field near the top of their store page. To find a seller's store page, look for the link on one of their ads. Alternately, all member stores as well as stores in developing categories can be located in the Seller Directory. Sellers can easily access their own rating page via the menu bar. Overall Rating Score: represents the general experience level of the seller. It is the number of users who have left a positive rating minus the number of users who have left a negative rating. Percent Positive: shows the percentage of positive overall ratings in the last 12 months. Ratings Trends: shows the trend of positive/neutral/negative ratings over time. Detailed Ratings: shows the average score in specific categories. Multiple ratings from same user may be averaged together. Detailed ratings are not visible until the user has been rated by at least 5 users in that category. The second half of the page shows a list of all ratings and feedback. 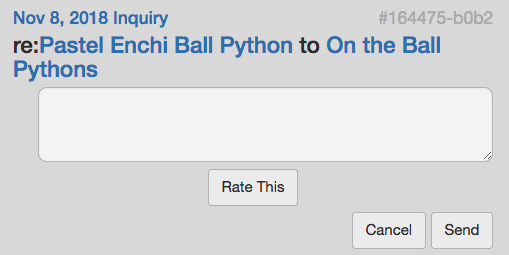 Feedback are categorized by whether this user was the buyer or seller and whether it was feedback given or received. Only one or two of these tabs may be visible. To filter by overall rating, click on the Rating Trends table. To filter by rating status (e.g., pending, disputed), click on 'Filter to' links. Sellers have additional filters that they can use to see ratings which are not currently visible to the public. Make sure to use the 'Reset Filters' link to view all feedback again. Buyers can accumulate ratings as well. This allows them to build up a reputation which will earn trust and respect with sellers and cause the ratings that they leave for sellers to carry more weight. This makes the buyer more valuable to sellers. A buyer's user profile is only visible to sellers to whom the buyer has sent an inquiry. The user profile includes a variety of information about the user which they choose to include, along with their Overall Rating score. Sellers who are members of MorphMarket can click this link to visit the buyer's ratings page. The user rating page is not as detailed as the one for a seller, but it does include similar information. Buyers can easily access their own rating page via the menu bar. Overall Rating Score: represents the general experience level of the buyer. It is the number of users who have left a positive rating minus the number of users who have left a negative rating. Recommended Qualities: specific categories for which previous sellers would recommend this buyer. These are not shown until they have received at least 3 ratings. 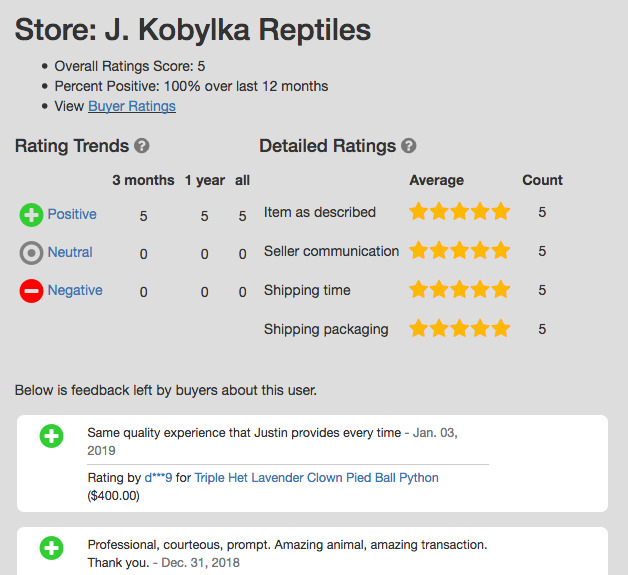 The second half of the page shows a list of all ratings and feedback left for other sellers. MorphMarket allows buyers and sellers to leave ratings and feedback about inquiries that led to transactions. A transaction is simply the complete payment and delivery of an item. Transactions that did not begin with a MorphMarket inquiry are not eligible for ratings on our site. Either party may click the 'Rate This' link on an inquiry on the messages page. The seller can also indicate a sale to a buyer in two additional ways: 1) by marking an item as sold on the inventory page or 2) by using the "sold to" reply action on the messages page. Either of these will cause the buyer to receive a message with a link to leave a rating. The same link will then also be found on either party's own ratings page in the appropriate tab. Once the transaction has been reported by one party, an email will invite the other party to leave a rating as well. Buyers and sellers have 90 days to leave a rating after the initial inquiry. If a seller indicates that an inquiry from a buyer resulted in a transaction, it is considered confirmed immediately. This is accomplished by marking an item as sold on the inventory page, using "sold" action on the messages page, or by rating the inquiry. If a buyer claims that the transaction occurred by leaving a rating, after 5 days it will be automatically confirmed and made public. Both parties have up to 60 days to dispute that the transaction occurred. Read more about Disputes below. Waiting until the item has been paid for and delivered. Trying to work out problems directly with the other party. Remain factual and courteous. Avoid personal attacks and profanity. Because feedback length is limited, choose your words carefully. You may add a link to a lengthier discussion about this transaction in a forum as described below. Finally, avoid including content that could cause your feedback to be removed as explained in the Moderated Content section below. Up to two follow-up comments can be added after 3 and 30 days. In turn, the seller is allowed to reply to each of these comments. None of these messages can be edited or deleted. Buyers are allowed to upgrade the overall rating. This is for situations where both parties work out their disagreements after the initial rating. The detailed rating scores, however, cannot be changed. Our rating system accepts a limited amount of information by design. If you wish to provide additional detail, we recommend taking your dispute to a forum. This will allow you to engage the other party in public with detailed comments, photos and screenshots, and involvement from the community. Each party is allowed to provide one link to a forum discussion about this particular transaction. You can add the link after you have created the initial rating. You cannot change or remove the link once you have added it. Links not about this transaction can be disputed and will be removed, possibly along with your entire rating. We currently support links to the following forums. You will need a free account to post there, and take care to follow all of their rules. After creating your post, copy and paste your discussion/thread link from your browser into the appropriate field on the rating. Open the discussion page by clicking the small gray date/time below your username at the top of your post. A key part of MorphMarket's rating system is that it is based around confirmed transactions. For this reason we allow the non-rating party to dispute the transaction up to 60 days after the initial rating. To initiate a dispute, click the 'Dispute' button on the rating page in question. A dispute event will result in the rating party being asked to provide evidence of the transaction within 3 days. During this time, the rating will be taken offline until a decision has been reached by MorphMarket to either accept or reject it. To reach a determination, MorphMarket will consider submitted evidence as well as the prior history of both accounts. Because we take the quality of our ratings system seriously, there will be consequences for those who falsely assert or falsely dispute transactions. Lost disputes may be shown on a user's ratings page and additional disciplinary actions may be exercised, including permanent ban from MorphMarket. While we work hard to limit ratings to actual transactions, MorphMarket has no way to confirm every detail in each feedback comment. In all other situations, the party being rated is given the opportunity to reply with their side of the story. 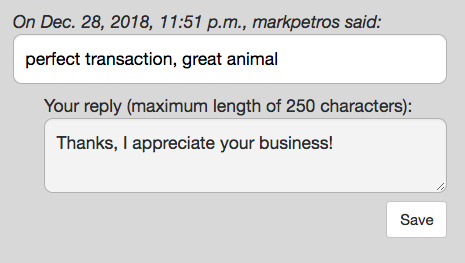 A seller may reply to each and every comment made by the buyer, as well as add a link to a forum discussion with more details. Contested ratings should be always interpreted in light of the credibility of those individuals as demonstrated through their previously accumulated ratings. True character is only proven over time. Any attempt to create fake ratings to improve or harm a reputation will result in disciplinary actions up to a permanent ban from MorphMarket. This includes but is not limited to the use of multiple accounts either independently or in collusion with others. Identifying authentic ratings is a difficult problem which requires a conservative approach. As a result, sometimes legitimate ratings will not be promoted immediately, especially from users with less account history. These "reserved" ratings remain on record and can be accessed by the system and MorphMarket staff. The system is constantly learning and making adjustments, and reserved ratings may be promoted to public visibility in the future. Sellers may opt to not have their ratings shown publicly. This is an all-or-nothing decision which can be toggled under the Seller's Profile. Opted-out stores will show a message indicating that their reviews have been hidden. Buyers are still allowed to create ratings for sellers who are opted-out, but they will not be public. MorphMarket will still use these ratings to monitor performance, and if any seller's scores falls below a certain point they may lose selling privileges. Ratings left by opted out sellers will be reserved and not publicly displayed. Can my ratings include feedback from the Inquiry Survey system? Past positive and negative Inquiry Survey Feedback that a store has accumulated are not eligible as ratings. The Ratings system has a higher standard and requires confirmed purchases. The older system did not limit feedback to buyers. Also, the terms by which users provided that feedback in the old system stated that it would be kept privately on file, and thus it cannot be used in this manner. That data is still on file, however, and can be used to the full extent for which it was collected. How can I leave or receive a rating for a purchase made outside the inquriy system? We realize that sometimes buyers find ads on MorphMarket and contact the sellers directly via text or Facebook. Unfortunately, only transactions that involve a MorphMarket inquiry are eligible for ratings on our site. The reason is that we have no visibility into such transactions. This makes an already difficult problem of quality control completely impossible. On the other hand, we do not have a rule against a user sending an inquiry on an item that they just directly purchased which is not yet marked as sold. Why is my rating not showing up? This could be caused by several reasons. Look at the rating on your ratings page to determine its current status. It could be pending confirmation by the seller. It may have lost in a dispute process. Or it may be in reserved status. Is there anything I can do to convert my reserved rating to be visible? First, please read about what reserved ratings are and why they exist above. The short answer is there are no actions you can take at this time to affect this. Other sellers have the same algorithms applied to them. As your store and the reviewers get more history in our system some of those will be converted to visible (so think of them as delayed not lost). As our algorithms get better the % of reserved will go down in general across the board. Less than 20% of ratings are reserved across the board. The exact percentage in your account can vary for many factors. Moderating this sort of content at scale is a complex problem, even for billion dollar companies. Why can ratings and comments not be revised? We encourage users to wait until the item has been paid in full and delivered so that they have all the information they need to leave an accurate rating. For this reason we give users up to 90 days to create a review after the initial inquiry. Modifying ratings and previous comments would create a lot of confusion. We also want to discourage rating retaliation, or the adjustment of ratings due to other ratings. However, as we do want to encourage problems to be worked out, we allow the buyer to revise their overall rating upward. Why is my inquiry too old to create a rating? We allow users 90 days from the time of their inquiry to leave a rating. This period is long enough to accommodate the vast majority of purchases. The most accurate ratings can be left when the experience is still fresh in both the mind of the buyer and seller. Also, if there are disagreements then they are best sorted out around the time of purchase. This may be why other sites like Ebay have the same type of policy. An additional reason we do not allow unbounded ratings is to protect sellers from negative ratings about health issues that arise well after the purchase. Once sold, the well-being of the animal is largely out of the control of the seller and is more a function of the owner's care. Can a rating be created if a buyer does not complete their payment plan? This scenario does not meet the requirements of the ratings system, which include a completed payment and a delivered item. What should I do if I payed for an animal in full but never receive it? Sometimes delays are normal, especially around bad weather conditions in the winter. However, concerns about scams should be reported directly to disputes@morphmarket.com. What should I do if the buyer files a chargeback after I have left a positive rating? Unprovoked chargebacks should be reported to directly to disputes@morphmarket.com. How can I change the username associated with my ratings? Very infrequently, you can change your username under Settings. As a seller, I don't believe I was fairly rated. What can I do? If possible, try to address the buyer's concerns on the side. After the initial rating, they are still able to revise their rating by raising the overall score as well as leave additional comments. Respectfully tell your side of the story by replying to each of the feedback comments. If you need more space to explain, create a thread in a supported forum with more details and link the rating to it for future readers to see. As a last recourse, you are permitted to opt out of having your ratings publicly shown. While it won't change your rating, you can also leave a Rating for the buyer as well. Take comfort knowing that even the best services receive a negative rating occasionally. People understand this and will interpret it in the context of other ratings. Make sure to mark all your items as sold to the buyers to encourage other ratings.